I love that crocheted lace. Found in a basket of lace made by my husband’s great-grandmother, this lace I find most delicious. After making several pendants this week, only a short bit remains. 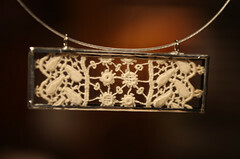 I hope that Grammie would be pleased that her lace is being worn as jewelry. Almost as much fun as the soldering, was the packaging. Were I to sell in large volumes, these absolutely fun touches would no longer be possible. And the little packages wouldn’t be complete without a MOO card. I love MOO. 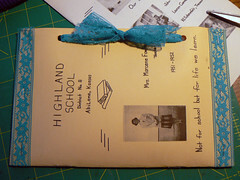 The package is ready to go, and that sweet teacher on the cover, that’s my husband’s grandmother. I’ve come to the realization that I may not get large quantities of time in the studio this month. That’s okay with me. I would never give up the opportunity to work so closely with my family. While my enjoyable moments of soldering were treasured this week, my heart keeps turning back to wax. I’m really looking forward to October. 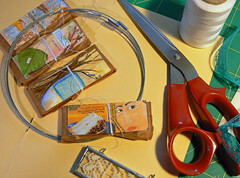 Judy Wise’s Hot Wax Workshop begins Oct. 17! And I just can’t wait! So cool Amanda! And what a wonderful way to honor the work of the past 🙂 enjoy Judy’s hot wax! Amanda, these are beautiful! You are so talented! Love the packaging too! heeeeey amanda! this is pretty cool! i have randomly been checking your blog this last year and half… you PROBABLY don’t remember me. but i’m back to blogging and had to stop by and say hi and i miss checking you out every week! your work has changed and i LOVE it!